Psiphon APK is an open code browser which helps to avoid the censorship which millions of people all over the world suffer. It is the censorship that prevents them freedom of expression and also other content on the Internet. When you start open the app, you get connected to the Psiphon servers which will give you access through a network of proxies and also get connected to any website in the world without any danger of being caught in the process. In short, the app gives you the freedom to anonymously and freely browse the complete web. When you get connected to this safe network of proxies, you can browse from the app’s own integrated web browser and also in addition set up your own bookmarks, set up a start up page and in general do everything you would want to do on a normal web browser. Though the features of the app are not as extended as other apps, it is an excellent app in itself and accomplishes its purpose very well. Psiphon is an amazing and awesome app for all the users of Android devices who face problems avoiding censorship. With the help of this app, you can freely surf the internet and visit any site you want. 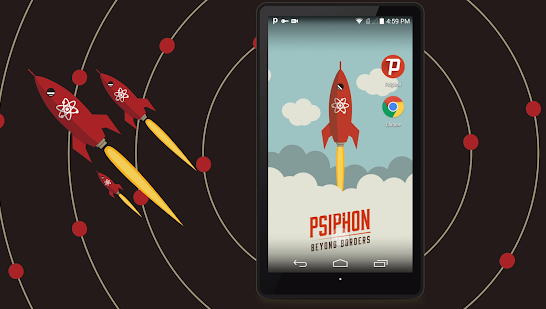 What are the Features of the Psiphon APK? The app keeps you connected all the times with global network featuring more than thousands of servers and diverse and varied entry points. The app does not require any registration. You just simply need to download and get connected for free. With the help of global Psiphon servers’ network, the users get a wider selection of protocols than a VPN providing unparallel access to everything on the Internet. The app has In app usage stats so you can track how much traffic you have used. The app gives you Configuration options which means you can make Psiphon your own VPN with customized proxy settings. The app gives you the option to choose whatever apps you wish to exclude from the VPN tunnel. The app is open sourced, peer reviewed and completely reliable. The app is free for personal use. The Psiphon app is really easy and simple to download and install. The app offers automatic selection of protocols which are in turn very effective and reliable. More than a million people across the world are getting connected to the Internet with the help of Psiphon app, the most trustworthy and stable tool on the web. The app gives the users access to websites and services which are censored, blocked or not available. Psiphon app is the best tool for accessing the internet when you are looking out for favorite news broadcast or you want to offer an extra layer of protection or be really cautious when you are using the public Wi-Fi services. So, in short, the app is a special type of software which makes sure that the internet is free to place for the users. And the best part of the app is the identity of the user is protected.